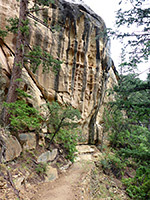 Although it starts in the busiest section of Mesa Verde National Park, at Chapin Mesa, the Spruce Canyon Trail is a quiet route, not receiving many visitors, since it is relatively long and passes neither ruins nor rock art. This is a loop hike, distance 2.4 miles, somewhat strenuous as it descends then climbs by 550 feet; the trail is usually completed in the clockwise direction, starting by following the short ravine below Spruce Tree House to the junction with Spruce Canyon, heading upstream for a while through thick vegetation, then returning to the rim via another short, unnamed tributary. The last section has the best views, as in other parts the high walls and tall trees restrict glimpses of the wider landscape. Attractions are the textures and forms of the eroded sandstone of the canyon walls, the varied vegetation, the chance of spotting wildlife, the peaceful nature of the canyon, and some distant views of cliff dwellings. 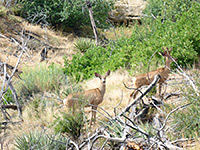 There is plenty of parking on Chapin Mesa; the usual place to start the hike is along the eastern section of the loop road, north of the museum and bookstore. Hikers are requested to register, either at the museum or in a log book near the start. 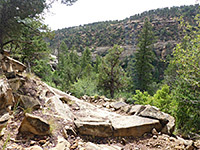 The first part of the route is the same as for Spruce Tree House (currently closed for repairs) and for the Petroglyph Point Trail - a few short switchbacks down to the canyon floor, and a flatter stretch across the slope on the far side. After two junctions, the second about half a mile from the trailhead, the Spruce Canyon Trail continues descending over ledges, via more switchbacks, back down to the usually dry streambed, crossing a wide footbridge to the west side then soon re-crossing to the east. The path runs briefly beneath a prominent cliff, partly streaked black, and is level for a while as the canyon floor continues to slope down. A few more, longer zig-zags take the trail further down, at one point through a thin, crumbling, coal-like layer of black stone. Penstemon rostriflorus and lepidum montanum are amongst the most visible wildflowers. The trail reaches a low point around the confluence of the side ravine with Spruce Canyon. One of the many closed, long-distance hiking routes in the national park continues downstream, loosely fenced off and marked with a No Entry notice; this particular path leads to the junction with the larger Navajo Canyon, where other routes continue north and south. The oak and pine woodland around the confluence is fairly open, the trees mixed with long grass and more wildflowers. The loop proceeds up Spruce Canyon through an area of taller trees, growing closer together, hence the views here are limited, as is the case for most of the hike. The path crosses to the left side of the creekbed - sometimes containing a shallow stream - then moves back to the right, shortly before the junction with the side canyon used to climb back to the mesatop. 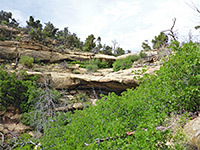 About half way along the main canyon, high in an alcove to the west, is a small ruin, Thomas House, while another can be seen on the canyon rim a short distance north. 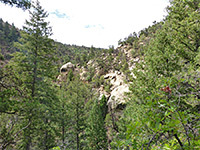 The side canyon ascends quite steeply and has fewer trees near the top, so the views here are more extensive. The final section of the path is southwards, close to the mesa edge, meeting an unpaved track through a residential area, which links with the west section of the Chapin Mesa loop road and then to another short track back to the museum.